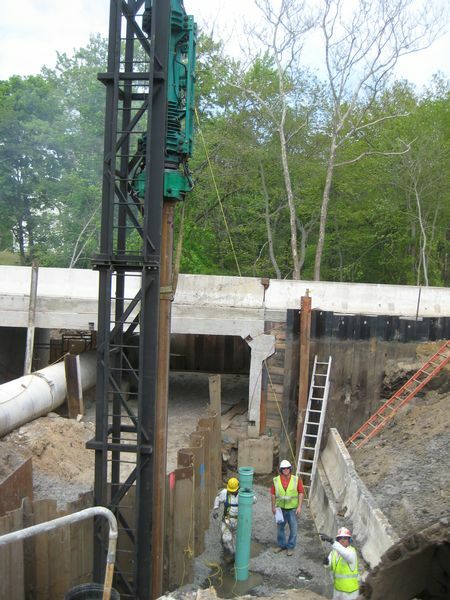 HISTORIC ROVA FARMS Pile driving necessity is accomplished with ZR technology The Rova Farms Bridge in Ocean County, NJ was originally built in 1929 as part of the infrastructure that is known today as historic Rova Farms. 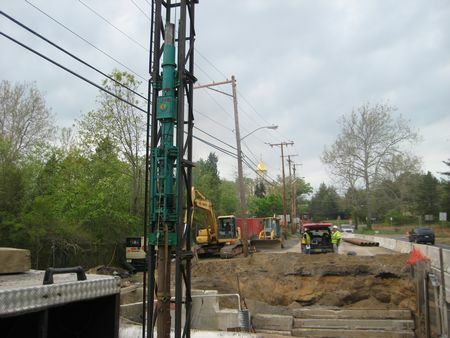 Located in Jackson Township, NJ, the bridge is being replaced with steel and concrete structure to protect the bridge from flooding & water damage. The historic location of Rova Farms Bridge was discovered by Russian settlers in the 1700s. It became a gathering place for Russian Americans where Russian traditions could continue and flourish; In 1934 The Russian Consolidated Mutual Aid Society of America, (ROOVA), bought 1,600 acres of land in the historic Cassville section of town and established a rural cultural center known today as Rova Farms. This site contains two historic Russian Orthodox Churches, Saint Vladimir Memorial Church and Saint Mary's Russian Orthodox Church, as well as a Russian restaurant and a flea market. The area was a resort throughout 1940s & 50s. Rova Bridge was actually a dam & spill way for Cassville Lake. Route 571/ Cassville road runs over the bridge in Ocean County, NJ & can be quite a busy area at times. The water from the lake was starting to undermine the road during heavy rains which caused major flooding. Lucas Brothers Construction had won the bid to replace the bridge/dam/spillway. The plan was to replace the current bridge & widen the spill way for the lake. They would also increase the safety of the bridge by adding shoulder space, updated guard rails & parapets. Lucas Brothers started the job in July of 2011 & is expected to finish in July of 2012. This 1.5 million dollar bridge project seemed easy enough however it was far from just another bridge & was full of challenges. Pat Kipp the Superintendent for Lucas Brothers Construction had to manage multiple priorities in addition to construction. The Rova Farms District is listed on the states register of Historic Places. The bridge, dam & spillway are considered contributing resources to the Historic district. They had to attach the new structure to an older section of the spillway without damaging the older pieces. There were vibration monitors that had to be set up for 2 nearby residential structures & the old spillway. 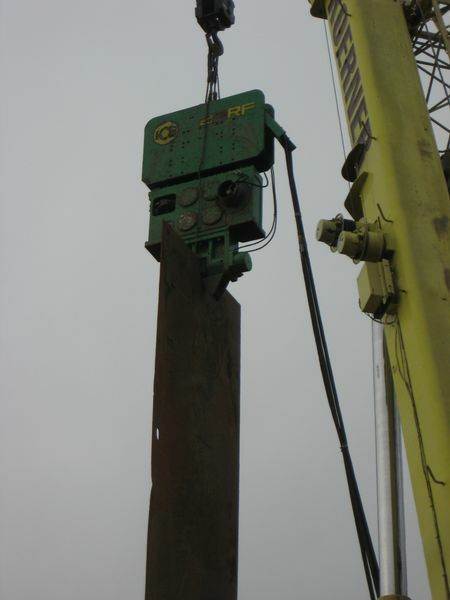 Some of the piles had to be predrilled and the work area was very small. 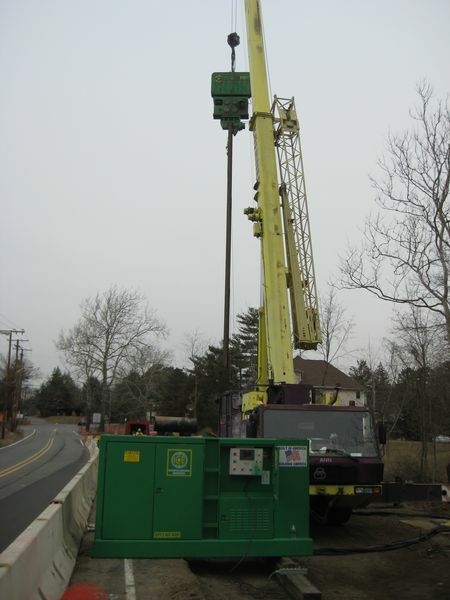 There were power lines that ran over the job that could not be moved far enough away & had to be de?energized when pile driving. Managing the flow of the water during the construction was also very tricky. Lucas Brothers couldnt disturb the waterway during certain times of the year as per the DEP Bureau of Dam & Safety & Flood Control. They also could not spill anything down on to the existing waterway & had to attach to part of the old spillway. The state wanted all traffic lanes to stay open during the construction and due to the area being prone to floods; the work was tough to keep on schedule during rainy times. There were also environmental concerns & spawning fish. The job had to be done in sections in order to keep the road open. Lucas Bros had added to the east side of the bridge first & then routed the traffic over there. Lucas Bros used several models of ICE? vibratory drivers on different occasions during the various windows of driving opportunity. They were able to utilize ICEs solutions for vibration sensitive areas such as this historical bridge replacement where older structures must be preserved. The zero-resonance vibratory driver/extractors do not vibrate during startup and shutdown eliminating vibration in the damaging range by adjusting eccentric moment to zero during start-up and shut-down. Lucas Brothers used a combination of variable moment, zero-resonance and low head room vibratory hammers to make this job as friendly to the historic environment as the road remaining open was to the residence of this area. They drove both permanent sheeting & temporary shoring. Lucas Bros had to drive 25 PZ?27s for the permanent & 25of various types sheeting for the temporary. A variable moment hammer drove a large road plate (8 wide x ? x 60 long piles was the ICE? I-12 impact hammers. Once the bridge deck was poured, they could demolish sections of the old bridge, which were separated from sections to remain by cable cutting through 4 foot thick concrete walls and footings. The old section of the 20 inch thick bridge deck had to be cut into several 54 inch wide manageable pieces with an oversized road saw for removal. They were extremely heavy & fragile. The pieces had to be loaded in a postage stamp size work area with traffic moving by. Installing & handling some of the pre?fab sections of the new bridge required some very intricate rigging as well as they needed to be tripped in mid-air once unloaded.